Paco, Paz, and Pepe love to keep us on our toes. Just when we think we’ve got it all figured out – or wait, let me stop there. Correction: we NEVER feel like we’ve got it all figured out. Here’s a more realistic re-phrase of that sentence: Just when we think we have solved all current/major/urgent issues/needs (that’s better), they crop up with something new to surprise us and send us right back to the drawing board. Just in case I haven’t mentioned it before, toucans are tricky! The Three-Cans are fed fresh fruit twice per day, with the heavier portion provided for breakfast and a smaller amount for lunch as they tend to eat less in the afternoons. The exact amount they actually consume varies from day to day, often based upon what fruits we have served them. One of the luckiest things about having three Toco toucans (besides the main lucky thing of actually having three Toco toucans) is that I am able to get a good idea of a base comparison of what is “normal” and what isn’t for their species. With three same-species birds in the exact same living situation, I get a general picture of how much they tend to eat, etc. If two of the Cans are doing something one way, and the other isn’t, I have more of an inkling that something is actually amiss, rather than grasping at straws with what I can find on the good ol’ Google machine. One such instance has recently arisen. For awhile now, Paco has progressively been eating less and less of his fruit each day and lately, sometimes not even touching it at all; while Paz and Pepe continue to polish off the same serving size with gusto. Thankfully, this wasn’t too concerning as he was still eating plenty of his Mazuri pellets, as well as many blueberry treats throughout the day. He hasn’t seemed to have lost any of his appetite and has been just as perky and gorgeous as ever. However, it is important for him to eat his fruit for the nutrients and moisture it provides. So, I took out my smoking pipe showpiece (every girl has one) and went all Sherlock Holmes on the issue, determined to get to the root of why he has stopped eating his fruit. I wondered – was I giving him too many treats that he wasn’t actually hungry for his meals? This is a likely contributing factor as Paco spends more time with me and therefore gets more training treat rewards than the other two. But this couldn’t be the whole problem. I also considered that perhaps he was just too busy to eat on most days and somehow forgot. Paco is known to obsessively play with his toys for hours on end, much more than Paz and Pepe ever do, which means his schedule is quite packed. But again, I had an inkling that this wasn’t the entire issue either. When I really think more about who Paco is as an individual, I suspected that the main issue was the lack of “fun” to his food. Perhaps he is simply too bored of it to bother eating it. If Paco was able to verbalize his life motto, it would likely be “if it ain’t fun, it ain’t worth it”. Over this same time period of deserting his food bowl, Paco would still eat something if it was presented in a way that ignited his curiosity. He loves it if I serve him his fruit chunks on a spoon, feeding him like a baby. He loves to “share” fruits with me (see: Enrichment on the Menu: Bonding Through Food) – if I appear to be eating something, he definitely wants a taste. If I bring in a whole piece of fruit to show him, he loves to peck and attack it. And while we are good with mixing up the variety of fruits we serve, we haven’t been as good about mixing up the variety in which we serve them. I decided to see if he would prefer to pick at whole fruit, rather than eat it pre-chopped due to noticing his enjoyment in scraping the fruit off the skin at times. So I started by providing a half papaya in all three of their bowls, as well as chopped papaya – knowing that because they love papaya most, they would eat at least one of the options presented. And sure enough, Paz and Pepe ate all of their chopped papaya, not touching the whole piece, where Paco on the other hand, left the chopped papaya untouched and scraped all the papaya flesh off the whole fruit piece. Bingo! Problem solved. Elementary, my dear Watson. (Okay, that’s it, I promise. Cockiness abated for fear of the next “issue” being much more difficult to solve – fingers crossed, knocking on wood, humble attitude re-instituted). For the last week now, we have been serving Paco his fruit in semi-whole form. We don’t serve the entire fruit because he doesn’t eat that much, but he has been picking away and seeming to have fun throwing the fruit around and actually consuming more of it than he has in weeks past. I’m happy to see him eating more again but am well aware that this won’t last for long. I have not yet retired my thinking cap and am working on the next idea to keep Paco entertained at his meals. If I’m not careful, before you know it, I’ll be starring in some sort of dinner theatre production extravaganza. Ah well, at least that would give me an opportunity to wear more costumes. I have definitely hit some roadblocks in developing foraging ideas for the Three-Cans that are both a challenge, yet still possible for their toucan beaks. Fruit is also tough to work with foraging-wise, as it gets mushy and it not easily hung, skewered, etc. If anyone else has any ideas, please do share and I’ll be sure to let you know what I come up to keep the monkeys guessing next. 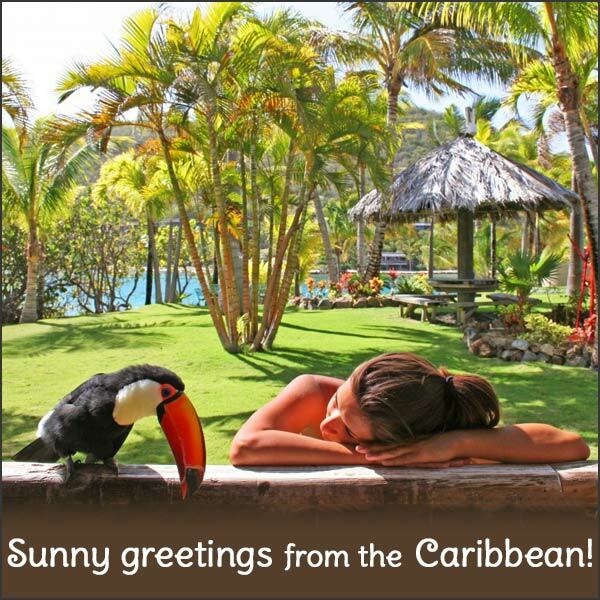 This entry was posted in Diet and tagged Adventures in Toucanland, bird, birds, BVI, Caribbean birds, diet preferences, exotic birds, exotic pets, frugivores, fruit, island, Paco, papaya, Paz, Pepe, pet, pet bird, pet birds, pets, Saba Rock, Three-Cans, Toco, Toco Toucan, Tocos, Toucan, toucan diet, Toucan Lady, toucanland, toucans, tropical birds, tucan, tucans by Toucan Lady. Bookmark the permalink. Hi! I think this may be a little weird, but do you think putting some berries or fruit in one of those balls that dogs use, like, the toucan can roll it around and play, and the food comes out. I imagine it might be messy, and I’m no expert on pets, but it’s just an idea 🙂 Love your blog! No, that’s not weird at all, thank you for sharing! I have actually tried that before with both the dog and bird balls that are made that way and unfortunately, the Three-Cans aren’t quite able to manipulate them properly to get anything out of it. But I have made some similar things of my own with bigger holes in coconuts, etc. I appreciate you thinking of us, I’m always looking for new ideas!